In the 1930s, the late Teo Teck Huat founded a building construction business. A historical landmark project is the original Cathay Cinema. Following the incorporation of the Company in 1970 under the name Teo Teck Huat Enterprises (Private) Limited, the Group continues to expand in the building construction and property development business. Subsequently, it changed its name to Teo Teck Huat Investments Pte Ltd and later to Amara Holdings Pte Ltd. Amara Holdings Limited was listed on SGX Sesdaq on 15 August 1997 and transferred to SGX Mainboard on 10 July 2000. 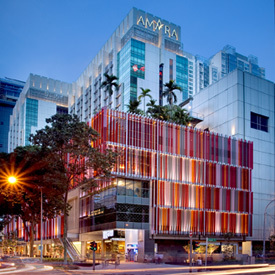 To capitalise on the growth of the tourism industry in Singapore, the Group expanded into hotel investment and management and developed the Amara Hotel and Shopping Centre in the mid 1980s. Following that, to complement its hospitality management operation, Amara set up a number of specialty restaurants and a food court.